Desertification offers a comprehensive overview of the subject and clearly emphasizes the link between local and global desertification processes and how past and current policy has affected arid environments and their populations. This text adequately applies the research undertaken during the last 15 years on the topic. Desertification has become increasingly politicized and there is a need to present and explain the facts from a global perspective. 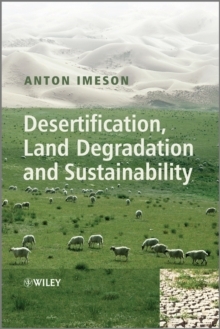 This book tackles the issues surrounding desertification in a number of ways from differing scales (local to global), processes (physical to human), the relationship of desertification to current global development and management responses at different scales. Desertification has been mainstreamed and integrated into other areas of concern and has consequently been ignored as a cross cutting issue. The book redresses this balance. Making use of much original data and information that has been undertaken by many scientists andpractitioners during the last decade in different parts of the world, Desertification, Land Degradation and Sustainability is organised according to the principles of adaptive management and hierarchy theory and clearly explains desertification within a framework of evolving and interacting physical and socio-economic systems. In addition to research data the book also draws from the National Action Plans of different countries, the IPCC Fourth Assessment on Climate Change and the Millennium assessments. Clearly structured throughout, the content of the book is organised at different scales; local, regional and global. It also specifically explains processes linking top-down and bottom- up interactions and has a strong human component. The historical, cultural and physical context is also stressed. Clearly organised into the following distinct sections: a) Concepts and processes b) Data c) Impacts d) Responses e) Case studies. This text is essential for anyone studying desertification as part of an earth and environmental science degree.